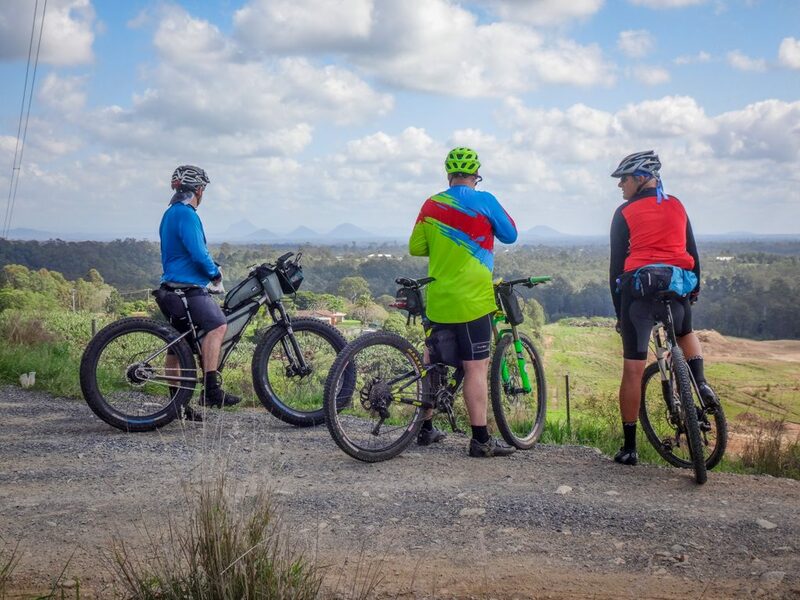 We rode to Scarborough via North-Lakes and stopped for a bit of a break to enjoy the view of the Glasshouse Mountains across Deception Bay. The weather has been perfect for over a month, so we were able to see a long way in the clear air. 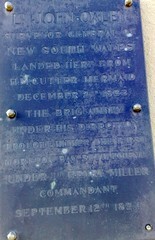 At Scarborough we bumped into an old bloke named George. 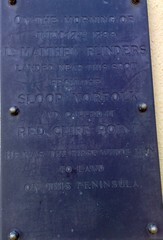 He’s 93 years old and tells me the secret of living a long life is “good tucker” and going for a walk every day. 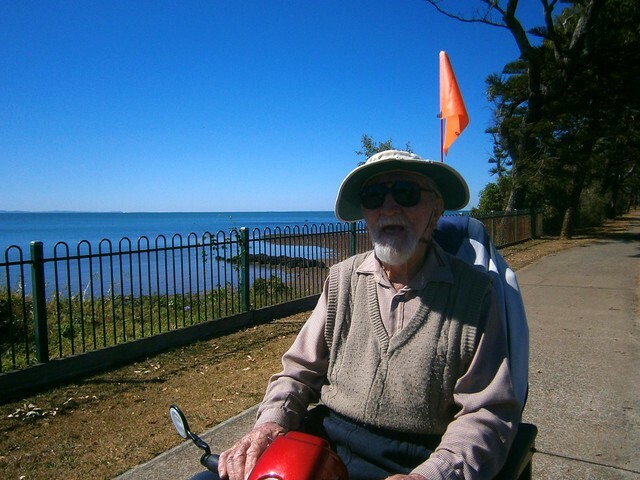 George grew up in Parkdale (south of Melbourne) and says he remembers as a kid in the 1920’s how deliveries were brought to his house by a cart pulled by Clydesdale horses. 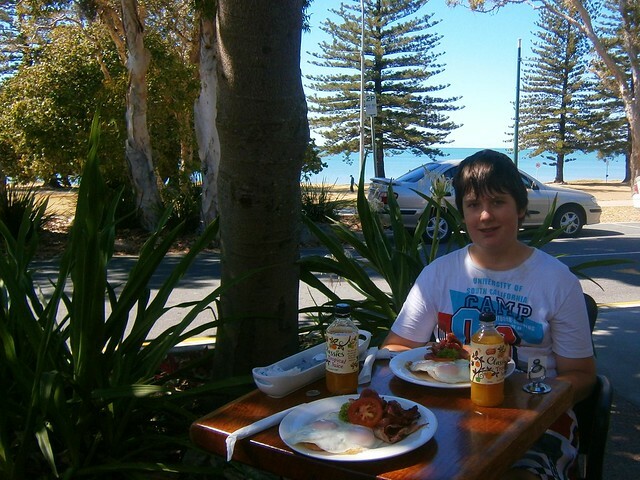 Harrison and I had breakfast at “Sangers on the Beach” right across from the water at Scarborough. 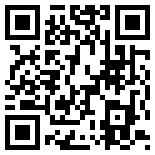 The food was delicious, the service was quick and the waiters were friendly. What more could two hungry cyclists ask for? 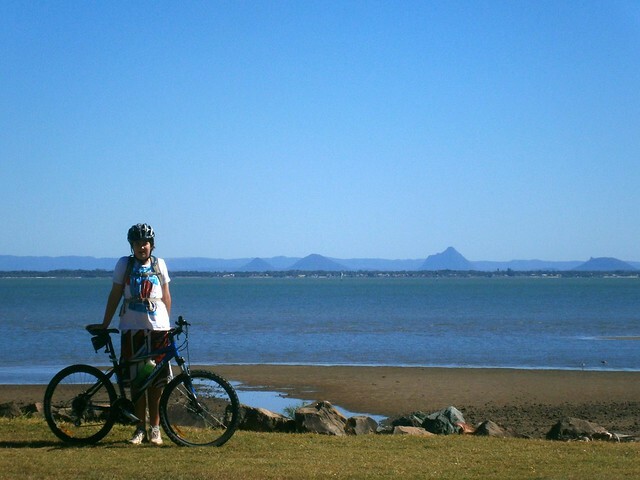 The cycleway at Redcliffe follows the beach for over 10km, so there are plenty of nice views over the water. 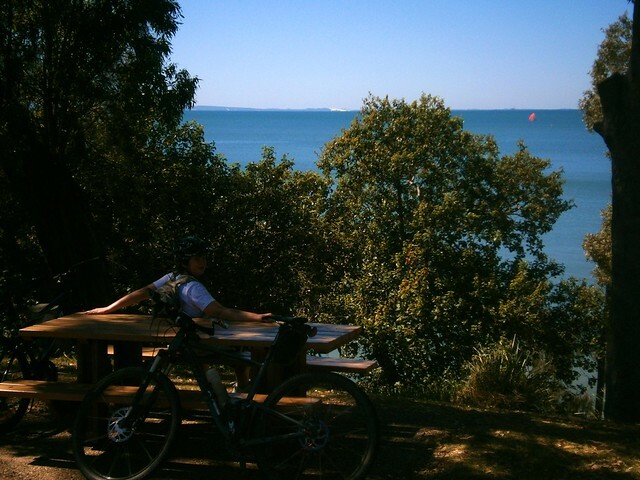 Finally, we stopped for one more quick break at Woody Point on the headland to cool off in the shade and check out the sail boats on the bay. 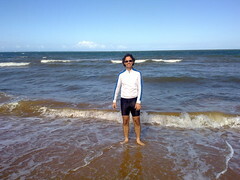 We rode 57km in about 4 hours. The pace was slow to allow Harrison to enjoy the ride. You need to watch out for the traffic on Anzac Avenue, but apart from that it’s a pretty sedate ride which rates about 5.5 out of 10 on the tough-o-meter. 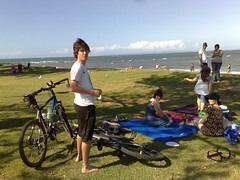 Ken and I rode out to Redcliffe to meet everyone else for a picnic. It was a perfect day for it. 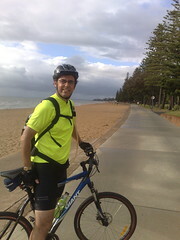 For someone who hasn’t ridden more than 10-15km at a time, Ken handled this 60km ride really well. 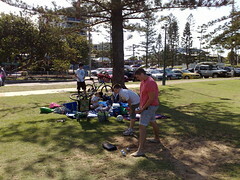 I think all the nice food at the picnic might have helped too! 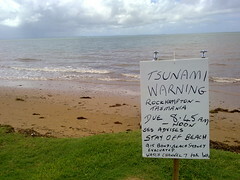 All of South-Eastern Australia was on a tsunami alert this morning after the earthquake in Chile. On the hill behind this makeshift sign a lone TV cameraman sat watching the horizon for the scoop of the day which (thankfully) never came. Here’s some more pictures from this morning’s ride. This is the view to the North-West from the Hornibrook Bridge looking towards Hayes Inlet. 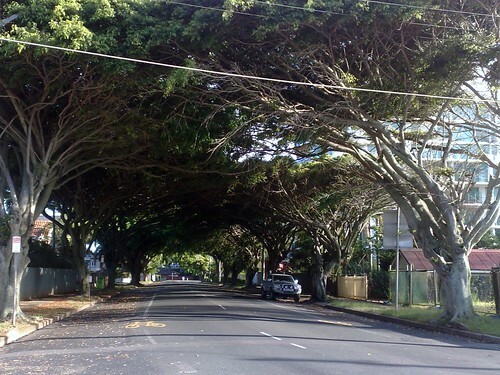 And this is a great looking street in Redcliffe with a beautiful canopy of Moreton Bay Fig Trees – really enjoyable to ride through. 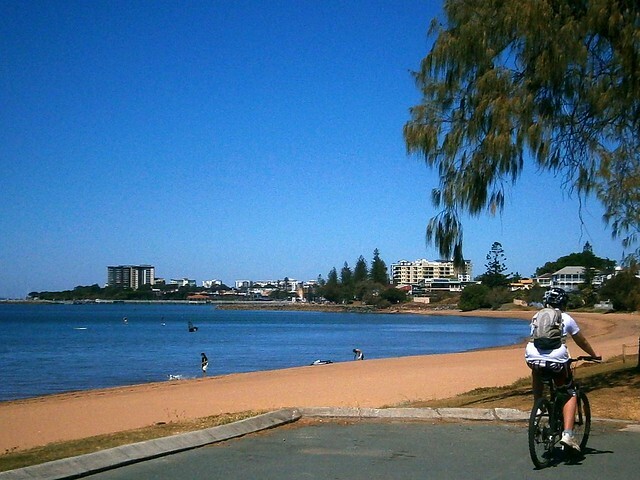 Some pictures from our ride to Redcliffe this morning. 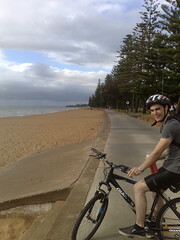 Lachlan and I rode out from Lawnton along Anzac Avenue to the Redcliffe peninsular this morning. 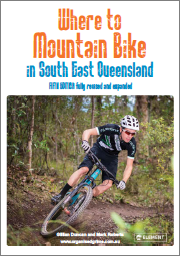 We followed it around to Woody point, over the old Hornibrook Bridge, and back via Deagon, Bracken Ridge and Strathpine home. All up about 53km in 2 and a half hours. Between 5am and 7am the sun isn’t too much of a hassle, plus we had light rainfall for some of the way which kept the temperature pleasant. We had to get up pretty early to get back before breakfast!